Like a dermatome, a myotome is a zone in the body that is served by one spinal nerve root. The difference is that a dermatome is a zone in which sensory nerves travel on their way back to the central nervous system with information about things you feel - heat, pain, itches, your body's position, how stretched out your muscles are, and more. Myotomes, on the other hand, are zones where ​motor nerves travel as they fulfill their responsibilities of signaling your muscles to contract. Both myotomes and dermatomes are "mapped," which provides doctors and physical therapists with a reference for determining - based on observation and testing - the specific nerve root(s) or spinal core level(s) that may have been compromised and/or are causing symptoms. Myotomes and dermatomes are a part of the somatic (voluntary) nervous system, which is part of the peripheral nervous system. 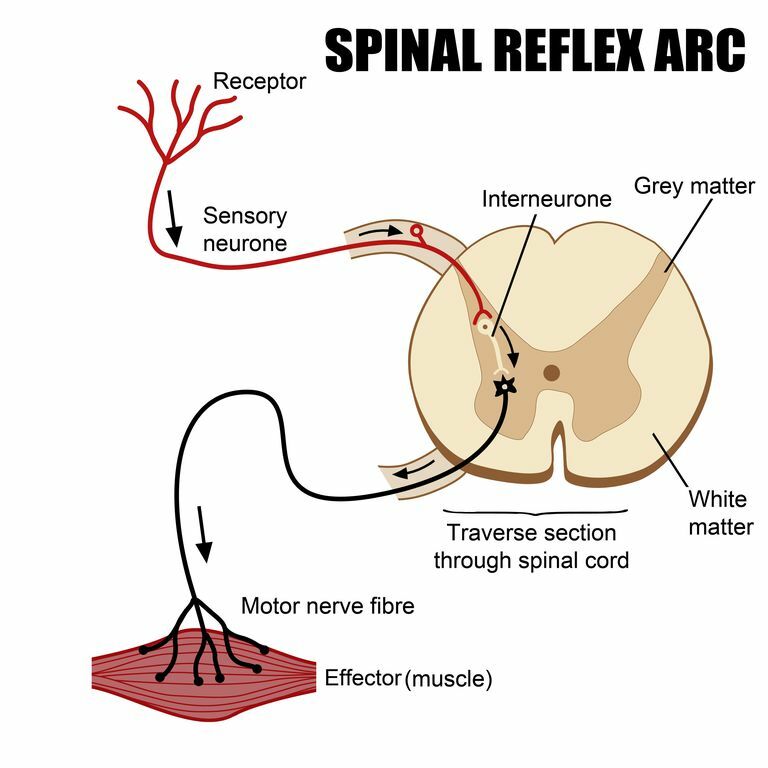 The peripheral and central nervous systems communicate with one another regularly. Muscles and Nerves, Oh My! Every muscle cell in your body needs input from a nerve in order to stay healthy. Without at least some communication between nerve and muscle (a phenomenon called tone that is very useful for keeping your joints stable), the muscle begins to decay. This communication happens at a very important place in the muscle fiber cell called the motor endplate. The nerve cell, along with the endplate is known as the neuromuscular junction. One nerve cell innervates several muscle fibers. This is called a motor unit. Every fiber that is part of a motor unit contracts (works) when its respective nerve is fired. It's an all or nothing proposition. To avoid muscle and nerve "burn out," motor units take turns firing. All this is happening at the microscopic level, mind you, but depending on the size of the muscle and the jobs it does, a nerve cell can innervate as few as 6 to 10 muscle cells (think fingers that play piano, chop vegetables, sew, write, or muscles around the eye's that help focus, blink away tears, keep you safe on the road, and more) to hundreds (think mid-back and arm muscles, where fine coordination is not as important). Another way to understand motor units is from the perspective of the muscle. A many-fibered muscle contains an innumerable collection of motor units. Now that you know what a motor unit is, understanding a myotome is a matter of viewing things from a more global perspective. A myotome is the group of muscles on one side of the body that are innervated by one spinal nerve root. Doctors use their knowledge of the location of myotomes (and dermatomes) during the physical exam. To identify the specific spinal nerve(s) that may underlie muscle weakness, they perform isometric strength tests according to the myotome map. Below this section is a chart that gives the names of the nerves and the action they produce by innervating the responsible muscles, i.e., the map. Before I show you that, let me just say that the myotome deciphering process can at times be sloppy. In other words, even though myotomes (as well as dermatomes) have been "mapped," in practicality, the zones are not always clear-cut and distinct. There is often overlap, where nerves will innervate muscles in zones other than the ones in which they're officially "mapped." C8 Thumb extension; Ulnar Deviation Pectoralis major (sternal head), pectoralis minor, triceps, flexor digitorum superficialis, flexor digitorum profundus, flexor pollicus longus, pronator quadratus, flexor carpi ulnaris, extensor pollicus longus, extensor pollicus brevis, extensor indicis, abductor pollicus brevis, flexor pollicus brevis, opponens pollicus, scalenus medius & posterior. T2-12 Not tested Thoracic nerves control muscles in the trunk and abdomen, and are generally not tested. L3 Knee Extension Quadriceps, adductor longus, magnus & brevis. If you're the kind of person who learns by doing, I suggest you check out one or more of the YouTube videos linked below. These were produced by physical therapy assistant school cohort groups (and one physiology class) from around the country. Because each video has both strong and weak points educationally, it's probably a good idea to look at all of them. Note: Most of the dances are done to a very fast beat. I suggest you move at the pace your body (particularly your neck) can handle safely. Most likely, this means going slower than the physical therapy students. Overall, though, these dances may give you a good idea about what myotomes actually do, and why they are important. And the music is pretty good, too. Barkhaus, P., M.D., et. al. EMG Evaluation of the Motor Unit - Electrophysiologic Biopsy. Medscape. Aug 2013. Magee, David, J. Orthopedic Physical Assessment. 4th Edition. Saunders Elsevier. St. Louis, MO. 2006.